Rabett Run: Is the Earth Getting Warmer? A prominent leftist says "NO". Is the Earth Getting Warmer? A prominent leftist says "NO". A prominent left intellectual says "no". Journalist Alexander Cockburn, writing on his CounterPunch website, describes "the earth's current cooling phase, during which - contrary to warmest doctrine - CO2 levels have been rising." See Cockburn's essay, Sunspots and Republicans, March 3-4, 2012. on the CounterPunch website (www.counterpunch.org). So what is happening to the Earth's temperature? The largest data set was compiled by Richard A. Muller, Berkeley physics professor and former global warming skeptic. Muller got money, including Koch money, to ask, "is the Earth really getting warmer?" The Berkeley Earth Surface Temperature (BEST) project announced its findings in October 2011. They found - are you ready for this - that the Earth is really getting warmer. The graph shows the earth's land temperature for the last 60 years (1950-2010). The long-term trend is flat from 1950 to about 1975, and then increases by about 0.2 C per decade. The total increase from 1975 to 2010 is 0.8 degrees C.
Cockburn is a talented journalist, but on issues of climate change he is just not reliable. Not reliable?! He's just wrong, so wrong that it makes me question the quality of his other work. Rattus Norvegicus has the right of it. He is in some ways a very perceptive analyst, and is a good reference for someone outside of the standard liberal conservative dynamic on political issues. But for years he has been saying climate change is a fraud for ideological reasons. to him it is the corrupt corporate fascist interests that are trying to undermine the working people as opposed to the socialists that the right wing points to. Thanks for this, but the link to the Cockburn article is mangled. Your recent Counterpunch column asserts that we're in a cooling period. I disagree. I think one way we can both show our confidence and sincerity in our assertions is by betting over it. If you're worried about trusting the loser to pay, maybe we can find someone we both trust to hold the funds and earn interest, or otherwise figure out confidence-building arrangements. Regarding the graph: that peak in the late 1960s looks weird. The OP links are mangled (this morning anyway). 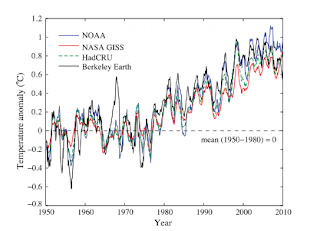 Decadal Variations in the Global Atmospheric Land Temperatures. I also wrote and told his manager that I dropped the subscription because his anti-AGW [*cough*] evidence was 'um, a pile of shite', and if he was prepared to dish out tripe like that it completely changed how I felt about the likely veracity of his other work. You need the back story via his encounters with George Monbiot. When cornered the great man needs to keep the dog away well from his homework, I can tell you! I actually blogged about it at the time. The links he provided to Monbiot are, well, dire. 'Prominent Leftist loses plot', more like. I still greatly admire Patrick Cockburn, and there's some great material still on CounterPunch. But when Alexander gives one of his weekend sermons and the topic is Climate... well, find another post to read. I've had two extended runs-ins with AC on this. I no longer visit his site. Herzberg is another impeccably accomplished specialist on the gross misunderstanding of the 2nd law of thermodynamics. My last email to AC, two years ago, asked him for an explanation of his strongly held, if otherwise totally nebulous, conspiracy theory regarding "corrupt corporate fascist interests" behind the climate science. No answer yet. The only public revelation he's made of actual aggrievement, caused by the alleged conspiracy, was a hearty complaint about a $7 tax on an airline flight to Spain. I'm still not sure to be elated or depressed to have gotten an example of such a self-avowed, massive intellect behaving like a cranky child. An idiot ideologue is an idiot ideologue--whether the ideology is left or right. When you start to value ideological purity above truth, you are wrong. Always. This is vaguely similar to David Bellamy, who also might be expected to be supportive of GW (he is, or rather was, a respected Env type). * Therefore GW is false. The use of tense (warmING, coolING) with regard to climate change is elusive. The global temp is constantly undergoing a much larger seasonal variation ( around 5K from Jan to Jul ) than the expected century change. Of course, thirty year trends are the traditional but somewhat arbitrary measure. By thirty year trend, the atmosphere is warming. This is still not necessarily contradictory with the thirty year trend (though it has decreased the value of the thirty year trend ) because the early aughts were a little warmer than trend and the late aughts were a cooler than trend. But what is causing this trend? How long will it persist? It's called "weather" aka "noise". Look at the accompanying graph. It is not at all difficult to find 10 year periods that show little warming trend. Hint: Start in a year with a big El Nino. I believe those comments demonstrate that the Berkeley Earth work is bogus. The two intermediate trends, ( eighties and nineties ), do end with El Chichon and Pinatubo. No such eruptions account for the recent cooling trend. I think Cockburn's basic problem, one he holds in common with his opposite numbers on the right, is an unthinking (meaning so taken for granted that it's unexamined) optimism about the future. It's a kind of early 20th century disease, agreed on at the time by every significant ideology in the Western World, and very much rooted in Dunning-Kruger. I suspect a distant future historian will find this factor to be proof that all of those folks had far more in common that not. Michael Shermer's pertinent current column in SciAm is worth a read (saw it in hard copy but for some reason couldn't find a link easily), although I suppose that everything of importance about the problem can be understood starting from the point that more than 50% of the population considers itself above average (or in Shermer's opening example, possessing above-average driving skill). It's entirely uninspiring to conclude that in asking people to deal realistically with climate change we are asking them to overcome what would seem to be a deeply-rooted aspect of human nature. They will respond, eventually, after being hit over the head with sufficient force, but by then how much will be irretrievably damaged? What it shows is that 10 year trends and 11 year trends and 12 year trends are not climate. Foster and Rahmstorf showed that if you account for the main sources of "weather" the warming continues at the same pace. Waldo, keep in mind 1) increase in anthropogenic aerosols, aka Asian brown cloud, 2) relatively weak El Nino and relatively extended La Nina since 1998, and 3) the longest and deepest solar minimum of the last 100+ years. I'll agree with you that the La Nina has ruled the 2000s though El Nino ruled the nineties. As for the Brown Cloud, it is described as brown, not white. Is the forcing of the brown cloud positive? Without the precise and accurate shortwave measurements necessary, one can't be sure. but the changes in TSI have been small. Do you believe there is a GCR albedo modulation? Thanks for the comments. I just fixed the link to the Counterpunch website. Prominent journalist probably has to have his tax form prepared form him 'cause he doesn't understand numbers. The only thing I've ever agreed with Cockburn about was a preface for a P.G. Wodehouse book he [Cockburn] wrote almost 40 years ago. Denying AGW because it's a conspiracy by the nuclear power industry? What a dumbo. "As for the Brown Cloud..."
Anony, think sulfur dioxide, which turns into sulfuric acid droplets, which reflect some incoming sunlight back to space. Think particulate aerosols, such as ash and back carbon, which block incoming sunlight. They also then heat up in the atmosphere, but half or more of that heat will then be radiated upward away from the surface. So, the net forcing of aerosols is definitely negative (cooling). "the changes in TSI have been small..."
Small yes, but not non-existent. All three factors I listed stand. That's the link, ligne, and thanks.